Social search engines are a great way to search across many social networking sites at the same time. They make it easy to find new friends, old friends, people to network with, and people with the same interests as you. Below are three social search engines that you may find helpful in expanding your network or friend circle. Whoisi is an easy to use search engine, currently in public beta, that allows you to find out what your friends are doing. The Whoisi search engine is unique because it’s public and can be edited by anyone, just like a wiki. Best of all, there is no sign up required and your friends do not have to participate on the site in order for you to keep track of them. Whoisi allows you to search with any name you want such as a real name, screen name, or even a nickname. As you can see in the screenshot below, Whoisi was able to find me and quite a few sites that I am active on. If there happens to be a site that a person is on but does not enable RSS feeds (like MySpace), then Whoisi will not be able to find it. You are given the option to add another person to Whoisi with the same name as the person you just searched for. For any person that is found on Whoisi, you can follow them, add another site (URL or RSS) that they are a member of, and even edit their current information. You might be wondering how you can follow people if there is no sign up required. Well, it’s all done with a simple cookie that Whoisi sets for you and if you want to save that login so you can connect later or log in from another machine? Check out the “Login Later” link on the right hand side and bookmark the magic URL. So what if you search for a person and no one comes up at all? If you know the person, you’re able to enter a name and URL (with an available RSS) for them and you’re done. That site will now show for the person when they are searched for. yoName is a cool identity search tool that allows you to search for people across social networks, blogs, and more. With yoName you can search by email, username, first and last name or phone number. Their advanced search options even allows you to pick which sites you’d like to search through; currently you can search 27 different sites. Sometimes searching for the same name on yoName may be inconsistent because their searches are in real time. So, “if a social network site does not respond to their search request within the allotted time period yoName will not display any results.” Also, you don’t have to worry about someone finding out that you were searching for them (by name) on yoName because all searches are anonymous. yoName can even help you find lost friends. All you have to do is enter information such as first and last name, nicknames, and info about the last time you saw the person. yoName will create a web page with the information that you enter about them so that sites like Google and Yahoo will be able to search the page. If your lost friend happens to search for their name in a search engine, they’ll be able to see that you’re looking for them. Ex.plode.us allows you to search by name or interests. Their advanced search also allows you to select which sites to search, just like yoName; currently you can search 15 different sites. Ex.plode.us also offers other features like collections, nudges, profile/mini aggregator and widgets. When searching for interests I had much better luck. I searched for “social media” as an interest and as expected, there were pages and pages of results. So, it seems that Ex.plode.us is more useful for finding people with the same interests as you. So what do you think of these three search engines? Do you use any of them or is there another you prefer better? Please let us know in the comments. 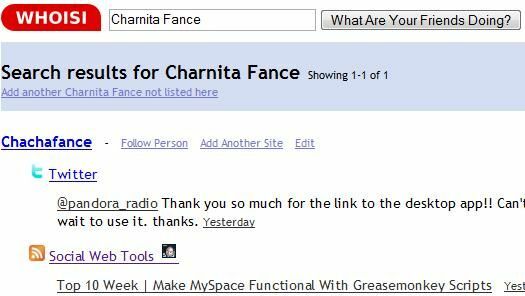 (By) Charnita is a social media addict & internet junkie. She blogs about web apps, internet tools, social networking, web 2.0 & internet marketing on her Social Web Tools blog. How to Handle a Copyright Infringement Notice From Your ISPWho Needs Photoshop When You Can Have Splashup? These three are cool. I would rank them yoname first, whoisi, second and ex.plode.us third. Try copenda.com ,a unique social people search engine, allows you to cross-search leading social networks to find your friends, singles for dating, people with similar interests and more. You should also add Spokeo People Search to your list. We're the only service that does a batch people search. You can search many many people all at once and browse through tthe information all that much faster. Thanks for detailed post. I would like to add Wink to your list, it's another good people search engine.